Former EPA Administrator Scott Pruitt's legacy took another hit last week as a federal court ordered EPA to ban a heavily used farm chemical. During the Obama administration, EPA said it would ban chlorpyrifos after health assessments showed current uses posed dietary and drinking water risks to humans, especially children. But Pruitt reversed the proposed ban in March 2017, declaring that the agency was returning to "sound science." The 9th U.S. Circuit Court of Appeals disagreed. In a split decision, a three-judge panel ordered the agency to revoke all tolerances and cancel all registrations for the pesticide within 60 days (Greenwire, Aug. 9). The ruling adds to a growing pile of court losses for EPA over the past year and a half. "EPA's record under Scott Pruitt and now under [acting EPA Administrator Andrew] Wheeler is pretty abysmal in the federal courts," said Patrice Simms, vice president for litigation at Earthjustice. "It's not terribly surprising. They're engaged in a reckless and irresponsible effort to undermine our public health and environmental protections, and not surprisingly, that's running up against what the law requires." In particular, EPA has had little success convincing courts that Pruitt's attempts to delay compliance deadlines for Obama-era rules were legal. The U.S. Court of Appeals for the District of Columbia Circuit last year ruled that the agency had unlawfully delayed a regulation requiring new oil and gas operations to reduce methane emissions. A federal judge in California earlier this year knocked down a delay in a regulation limiting formaldehyde emissions from wood products and a delay in a new rule for certifying and training pesticide applicators. The Trump administration also recently hit a wall in attempting to delay a decision on an industry challenge to Obama-era air toxics standards for brick and ceramic tile manufacturers. In a ruling that largely sided with environmentalists, the D.C. Circuit rejected EPA's bid to freeze legal proceedings on manufacturers' claims while the agency works on addressing their concerns via an administrative reconsideration set to wind up next summer (E&ENews PM, July 8). Under the 1990 Clean Air Act Amendments, the toxics standards were originally due in 2000. At oral arguments last November, the judges had roasted EPA attorneys on why yet another postponement was needed (Greenwire, Nov. 9, 2017). Bill Wehrum, EPA's current air chief, had represented the Brick Industry Association during much of the litigation, though he did not participate in oral arguments. In other cases, federal lawsuits have compelled EPA to backtrack on deregulatory actions. The agency, for example, withdrew an effort to delay implementation of the Obama administration's ozone standard after being sued by states and green groups. EPA suffered a high-profile defeat last month when the D.C. Circuit handed down an emergency stay blocking the agency's order to loosen a cap on production of high-polluting trucks known as glider kits. Pruitt had pushed through the order on his last day in office. Wheeler scrapped it barely a week after the court issued the stay (Greenwire, July 27). Bethany Davis Noll, litigation director at the New York University School of Law's Institute for Policy Integrity, said the courts are holding EPA to requirements in underlying statutes and that the decisions demonstrate "a certain level of resilience" in the Administrative Procedure Act, which governs agency rulemaking. "You need to go through notice and comment, you need to give us a reasoned explanation for your decision," Noll said. "These principles are being upheld in the courts." In the 2-1 decision last week, Judge Jed Rakoff of the U.S. District Court for the Southern District of New York — who sat in on the case in the 9th Circuit — slammed EPA for providing "no justification" for rejecting the chlorpyrifos ban "in the face of scientific evidence that its residue on food causes neurodevelopmental damage to children." Dan Farber, a law professor at the University of California, Berkeley, called the opinion "revealing." "First, it shows that courts are becoming impatient with foot-dragging by regulatory agencies. This problem isn't unique to the Trump Administration, but it's gotten much worse," he wrote in a blog post today. 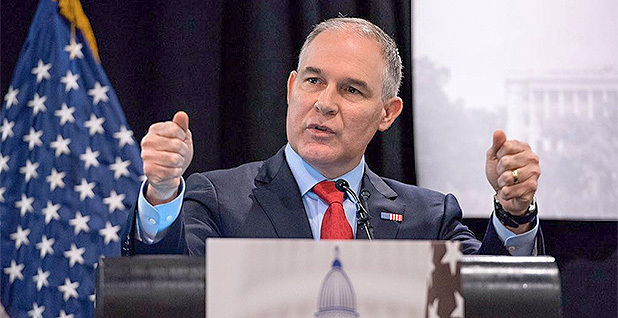 "Second, Pruitt's invocation of 'sound science' as a way of ignoring all the scientific evidence shows the hollowness of that anti-regulatory buzz phrase." He said it was notable that the government "had not even bothered to defend the actual legality of Pruitt's decision." Instead, government lawyers unsuccessfully argued that the courts couldn't review Pruitt's decision on the ban because the agency had not yet finished the process of weighing administrative objections. EPA said it's reviewing the chlorpyrifos decision, leaving open the possibility of appeal. "We expect that all appellate options to challenge the majority's decision will be considered," the agriculture division of DowDuPont, which makes chlorpyrifos, said in a statement last week. EPA spokesman Michael Abboud contends that the agency is hampered from assessing chlorpyrifos because of issues with epidemiological studies conducted by the Columbia Center for Children's Environmental Health supporting the ban. The center has found even low exposures to chlorpyrifos during pregnancy may lead to long-term brain damage in children. EPA says the raw data sets are necessary to come to a conclusion about the pesticide but that the school has so far declined to provide them. "The Columbia Center's data underlying the Court's assumptions remains inaccessible and has hindered the Agency's ongoing process to fully evaluate the pesticide using the best available, transparent science," Abboud said in a statement. The agency, meanwhile, plans to limit the types of studies that can be used in drafting environmental regulations. Under Pruitt, EPA issued a proposal that would effectively bar the agency from using specific studies for developing new regulations unless the underlying data "are publicly available in a manner sufficient for independent validation." But Rakoff wrote for the district court panel that EPA, which has documented likely adverse effects of chlopryrifos residues on foods on infants and children for nearly two decades, was bound by the law to revoke approvals for the pesticide. "Over the past decade and more, the EPA has stalled on banning chlorpyrifos," Rakoff wrote. "If Congress's statutory mandates are to mean anything, the time has come to put a stop to this patent evasion." To be sure, EPA has had a few victories on regulatory rollbacks. A judge in the U.S. District Court for the District of Columbia in April tossed out litigation challenging Pruitt's decision to indefinitely stay an Obama-era rule curbing toxic wastewater discharges from power plants. Judge Dabney Friedrich found that the lawsuit was moot because EPA had withdrawn the delay and imposed a new one lasting two years. "Arguably the agency got what it wanted there," NYU's Noll said. "They're trying to delay these rules so they can repeal them in the end." But even that victory may be short-lived, as greens are appealing to the D.C. Circuit. They've also challenged EPA's longer delay in the 5th U.S. Circuit Court of Appeals, which is hearing litigation over the underlying rule. The agency has had more success with federal appellate courts outside of Washington in supporting rollbacks or delayed implementation of "regional haze" reduction regulations affecting states like Arkansas, Texas and Utah. Under Obama, those rules typically required utilities to retool older coal-fired power plants with scrubbers and other controls to slash releases of sulfur dioxide and nitrogen oxides. Utilities and state regulators have argued that those requirements are not worth the cost, a view the Trump administration appears to share. As EPA offered no objection, for example, the 8th U.S. Circuit Court of Appeals in March agreed to stay implementation of Obama-era sulfur dioxide limits affecting several Arkansas power plants. Last week, Arkansas regulators finished work on a substitute plan that environmental groups say will require little, if anything, in the way of new controls (Greenwire, Aug. 9). Elsewhere, however, the administration is getting a lesson in how hard it can be to undo major air regulations, particularly those accompanied by mandatory compliance deadlines. Wehrum, for example, has repeatedly voiced interest in revisiting the agency's 2012 landmark rule limiting emissions of mercury and other toxics from coal-fired power plants. But most plants met the standards two years ago. The industry recently signaled a desire to move on, asking Wehrum to leave the regulations in place, albeit possibly with some "technical revisions" (Greenwire, July 11). If the regulated industry has already installed pollution controls, "they're asking industry to stop taking action that they're already doing, to go ahead and undo that," Earthjustice's Simms said. "That's much harder to do. And the public says, 'Wait a minute, you're going to stop telling them to run that pollution equipment?'" A few key tests of Pruitt's legacy remain in the courts. The D.C. Circuit, for example, has yet to issue a ruling on the agency's decision to delay Obama-era safety standards for chemical plants. Simms acknowledged that litigation will get "more complicated" as the agency moves from delaying rules to issuing substantive actions, such as a replacement for the Clean Power Plan. "When we're challenging a rulemaking that has gone through a complete notice-and-comment process and a comprehensive record has been created ... explaining where an agency does something wrong, either legally or factually, to a court and having a court understand what's at issue is a much more difficult proposition," he said. "In many of the cases that we've been litigating so far, the issue is a pretty straightforward legal question."